You can style this lemon dress up or down. 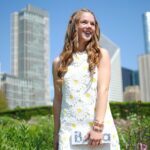 In these photos, I paired this lemon dress with my comfy cork wedges and a really fun lemon bag that I actually found by chance a day before my shoot. It was too perfect of a match to leave in the store. I cant wait to wear this dress with some cute green, yellow or white runners! These photos were shot right outside of Soho House which is this great place to visit and have a bite to eat in Chicago. I was excited to have a breakfast date with the lovely Jennifer Lake there during my visit. Everything is very yummy!! When life gives you lemons…ask for salt and tequila!